This is part 2 of my overview of the new Virgin Atlantic Upper Class Suite, launched tonight as part of the A350 launch event. You can read Part 1 of my A350-1000 Upper Class suite review here. The bar is dead. Long live The Loft! Virgin Atlantic has always been known for its social spaces. It was, I think, the first airline of the modern era to have a bar on its aircraft. Over the years the Middle Eastern airlines, primarily Emirates but also Etihad and Qatar on their A380 fleets, have taken this idea and run with it. On the most recent Virgin Atlantic arrival – the Boeing 787 fleet – the bar almost appears as an afterthought and doesn’t add as much as before. The Loft is a lovely looking area that accommodates eight people. It will be the first thing that every passenger will see on boarding the aircraft, and the last thing they see when they leave, and Virgin is hoping that it will encourage other passengers to trade up over time. There are five comfortable seats with seat belts in case of turbulence. These are made up of a sofa, facing the 32 inch wall-mounted TV, a table where two people can sit face to face and a solo seat. There is also an area where two people can stand, with a high surface for a laptop. The area has three charging points. The lighting system – which you can just see in the photo above – is gold plated for effect. The Loft has bluetooth capabilities for up to eight devices – this is the first time that I have seen bluetooth on a commercial aircraft. You can bring your own bluetooth headphones or borrow a pair from the crew. There are still technological reasons, apparently, why bluetooth is not available in airline seats but The Loft is the first step in making it available. 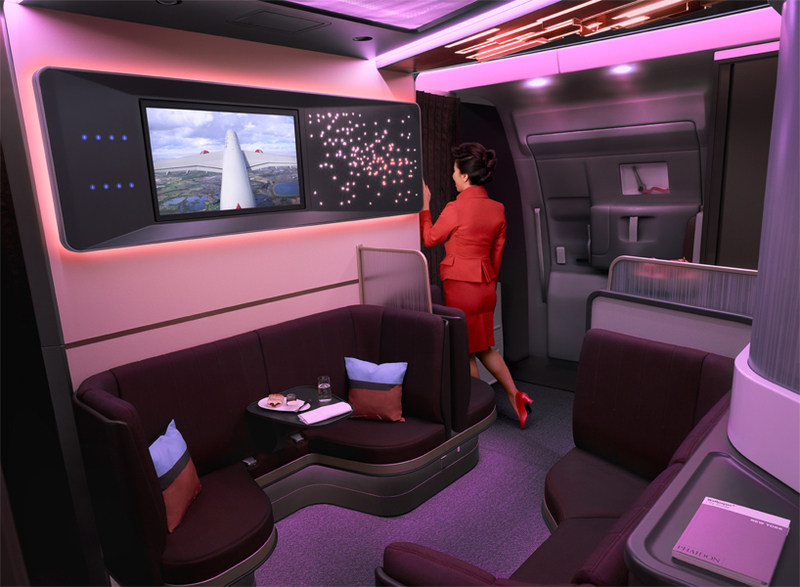 Passengers will also be able to connect their own device to the big screen TV via bluetooth, opening up the possibility of impromptu business meetings. The plan is that families or friends might choose to sit together on the large area of seating, whilst business travellers might choose to have a short meeting at the table for two or at the perching area. I know that Virgin has done a lot of research into how its Upper Class passengers were using their existing bar areas, and they believe that this is the best way to move forward. It is very possible that it will be used in ways that Virgin hasn’t considered. Either way, it is impressive and something that you won’t find anywhere else. Will the new Upper Class Suite be retrofitted? Virgin Atlantic does not want to commit at this stage. When I asked, there was an indication that the Boeing 787 fleet may receive a similar refresh when the aircraft go in for their first ‘D check’. There seems little sign of it being added to the A340 or Boeing 747 fleets which are due to be replaced by the 12 x A350 aircraft on order. This would only leave the A330-300 fleet of eight aircraft and the four ex-Air Berlin A330-200 aircraft. The latter have just been fully refitted with a totally different Upper Class Suite. I don’t want to start picking favourites between BA’s new Club Suite and Virgin’s new Upper Class Suite. Let’s leave that until we have had the chance to experience both products. A pleasant flight is also, of course, about more than just the seat itself. 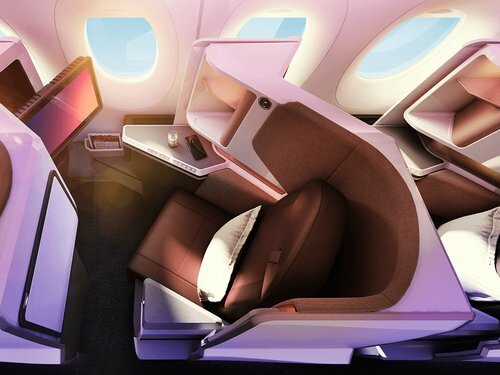 I should stress that, whilst BA is simply introducing a new business class seat on its A350, Virgin Atlantic has changed every part of the aircraft. Whilst Head for Points focuses on business class, there are also improvements in Premium and Economy which we will look at separately. I was never the biggest fan of the existing Upper Class suite. The lack of storage space and the coffin-style feel to the seat didn’t work for me. I preferred the ex-Air Berlin A330-200 when I flew it last year, and I am keen to try the refurbished version of that aircraft with a brand new suite. I do feel that Virgin Atlantic has missed a marketing gimmick by not having a fully closing ‘partial’ door on the seat. A quick stroll around Aircraft Interiors Expo in Hamburg last week showed that every seat manufacturer is now working on seats with ‘partial’ doors and they will become more common over the next decade. I’m not saying that I want a door (personally I never use them) – and Virgin is giving you a half-closing door – but you need something as the ‘hook’ for your advertising. Virgin will be relying on ‘The Loft’ and their unique suite design to do that. 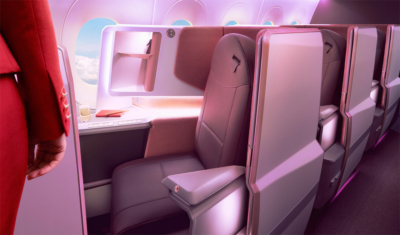 Virgin believes that the new privacy divider and suite design gives the optimum combination of privacy, seat width, sociability and service delivery (eg the ability to pass food and drink to you easily, something which BA may struggle with on Club Suite). It is also worth highlighting the contribution of Virgin Atlantic’s cabin crew to the Upper Class experience. The new suite will only work if there is a good crew delivering the soft product, and I have always found that Virgin scores well here. Where can I fly the new Virgin Upper Class Suite? The first A350-1000 is due for delivery this Summer and will enter commercial service in August. The first route will be New York JFK. Virgin also implied that the second and potentially third aircraft will also be dedicated to New York. As Virgin Atlantic does not have any short haul routes, you won’t see any commercial short haul test flights like the Madrid runs that BA is planning. 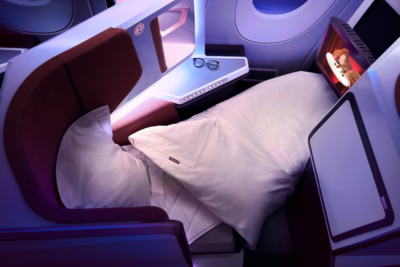 Both Virgin Atlantic and British Airways have really moved on with their new seats and I can honestly say that they both look as good, if not better, than anything else being flown by a European or North American airline. It will take time for a consensus to emerge over which of the new products is best – and I genuinely feel that both will have their fans. The real winners, of course, are the travellers. I look forward to trying out the new Upper Class Suite and The Loft later in 2019 and reporting back. You can find out more by visiting our Instagram page NOW – click here – and clicking on our logo to see the video ‘story’ which Rhys has just uploaded. The loft looks like a gimmick. By the time everyone and their dog has traipsed through a few times it will wear and who wants to sit on a sofa with 2 to 3 people they don’t know? A gimmick it may well be in terms of actual use, but I thought getting something designed as a “tempter” for the non-Upper passangers to walk through as the very first and last thing they see is quite a clever marketing touch to encourage them to upgrade next time. Releasing inhibitions, oooh get you! After all my time traveling UC on virgin I have never once seen a single UC passenger actually use the bar as a drinks bar. I have seen, traveling crew using it to have their meals whilst sat on the jump seats, used newspapers dumped on it, random paper work left on the bar but never ever seen a single person leaning up on the bar drinking! Its probably due to the overnight long haul flights I have been on but still it has been a massive waste of space (plus unsightly due to the mess on the counter) which hopefully the loft lounge seats will rectify. Although I seriously doubt it will influence passing PE customers to upgrade just to have access to the loft! All bars on planes are a gimmick. Have you tried the QR a380? Looks great. On a day flight a few people pass through. Night flights they are dead. They do however draw you in to using the product in the first place. Gimmick? Marketing tool? So what. VS has made a career out of gimmicks. Unlike most commentaries on this thread, I’m quite a social person, and will happily speak to random people. I’ve had some great conversations at the bar, including a Bond girl! I don’t sleep on day flights, and when they dim the lights, I get super bored after my 3rd movie. So, it’s off to the bar to read, stretch my legs, etc. The standing WeWork type area is even better: whilst working on a plane is not something I’ll ever do, being able to stand somewhere where I don’t get in the way of the aircrew will be a God send. As I fly often to SFO, the plane is normally full of Facebook, Apple, Cisco, Google folk, and I feel they’ll also enjoy this. Although I think that I enjoyed the bar area on the B747, A340-300 & 340-600 a lot more than the ones on the A330 & B787. Have stopped using them despite the fact that I have met many interesting people from all walks of life on those flights. Rob. Looking at the first pic of the seat (with the crew member’s arm in view) it shows the window being obscured by a cabinet at eye level. I’d be very disappointed if this is the case. @ David. That’s not what I’m talking about. The seat in the pic looks to have a small locker to put glasses/water bottle etc in at eye level. It is blocking the view out the window. Hmm, I don’t think it is. Look at the view from above in the “bed mode” photo – the locker is tucked around towards the side of the plane so you have a clear line of sight from where your head would be. Depends on the seat row. They have always had passengers monopolising the bar, hasn’t been an issue really. Some passengers just stand up and drink and chat with fellow passengers. Perhaps the same will happen in the loft. Passengers return to their seats if the seat belt signs are lit. The loft seats have seat belts for turbulence! It looks very good and I hope the seat is comfortable as a bed. I find the current Virgin one the most comfortable I’ve tried out of maybe 7 different lie-flats. I don’t mind standing up to fold it over, and nor did I need any help from the cabin crew! There’s an obsession in this “hobby” to try and make everything as private as possible and pretend other people don’t exist. I think a lot of you forget that humans are an inherently social animal and a huge amount of people actually enjoying interacting with others. An amusing example was when the crew raised the privacy divider while I was half way through a conversation with the guy facing me (initiated by him, so I’m pretty sure it wasn’t annoying him!). I’m a Software Consultant. I hate people. When I have to attend meetings with customers I normally arm myself with 2 packs of cigarettes. Really. I get this is a travel blog and you need to hype up the language. But these are products you won’t see generally avail label for years. 2023/4 in the case of some BA flights. I flew BA F yesterday. Check in awful, F security failed and back up is to join the south security. Concorde room lounge dragons miserable but the contract staff a delight. Food and service were very good. There had been a lot of hype about new wash bags, pyjamas, China, blankets and food. Well don’t get excited, the pyjamas fit so badly I reverted to my AA ones. The wash bags are dull and unimaginative, the pillow is cheap and very nasty but the blanket is fine. They both add a touch of Beige to the grey and blue! IFE system was simply awful. The food was good and clear step up and the china very nice. The crew were fine in F but one guy was a stranger to soap! Real World Flying is light years away from what the marketing hyperbole would have you believe. My bad, I guess it does depend on the route and timing of flight. I tend to fly overnight long haul to Asia. So I guess the use is somewhat limited compared to, say, tourist routes to the Caribbean where theres a different vibe onboard. Will they be flying from Manchester at all, or just from london? Heathrow initially. Manchester seems to mainly get the ex-airberlin planes. Is no one going to mention…. Custom PJs?! The polyester ones Virgin currently have are horrible and too hot, and fit no one (badly). And that they’ll come in T-Shirts also…. The bar has been very busy on most day flights I’ve been on. I really like it, makes me forget i’m on a plane for half an hour. I think it was Gulf Air on their Lockheed L1011 Tristars, in the early 70’s, who first introduced the bar concept in First Class. Have been Upper Class a couple of times and the bar was absolutely rocking during the day, all stools occupied and several people standing, great atmosphere, flight attendants had time to chat as well. It was dead on a night flight apart from me and the cabin crew, and I was pouring the drinks behind the bar. I read that the new seat will only be 20″ wide which is narrower than the old one. How is that an improvement?